For young mums keeping fit both before and after pregnancy is a problem. The halls latest user, Yummy Mummy Fitness classes meets on Mondays at 10am and can help expectant Mums and new Mums get back in shape. Simmone Rank offers 3 group fitness classes, through Yummy Mummy Fitness to help new Mums meet their fitness needs during and after pregnancy are catered for. Gain strength and fitness during pregnancy to prepare for labour and a speedy recovery afterwards. The classes are suitable for women who have previously exercised and those who are planning on lifestyle changes during this critical time as they cater for all levels of fitness. During pregnancy your core muscles endure enormous stresses which often leads to weakness in the core and back once baby has arrived. Back pains and bad posture are common side effects of this. These problem areas with at a Yummy Mummy pilates based exercise class. Babies & toddlers are very welcome to come along! Another good class is the child friendly boot camp classes for mums! If you want to get fit, strong and/or lose weight – this class is for you! All mums are welcome, whether they have a new born, toddler or your kids are already at school! Mums can start this class 6-8 weeks after a natural birth and 12-14 weeks after a c section. You can even join a free trial class! For more specific requirements and care, Yummy Mummy Fitness trainers can also be booked for 1on1 training sessions at your home or localpark. Check out the website under Yummy Mummy Fitness, listed under hall users links. Whatever positive goals you have, with proper trainings in our Wing Chun school you will improve your fitness level, self confidence, learn practical and effective skills that may protect you and your loved ones in unwanted situations. You can join the class on Thursday evenings in the Massey Birdwood Settlers Hall starting at 7pm. The classes are conducted by Sifu Antony George. Around the age of 19 Antony joined Black Dragon Jiu Jitsu and was taught by Professor Steve Heremaia for a number of years. During that time he trained extensively in throws, joint locks, wrist locks, sweeps and grappling. He left Black Dragon to travel overseas, including visiting the Shaolin Temple. When Antony settled back in New Zealand, he met Sifu Bruce Cheng, a master of Wing Chun from the Lo Man Kam lineage. Lo Man Kam’s style in particular interested him as Master Lo incorporates wrist locks and holds with his style of Wing Chun and Chi Sao. Antony says : “I have trained with my Sifu continuously for over 10 years and hold the utmost respect for him and our lineage. I currently run the Massey school, being the first training hall to expand from the Headquarters“. The Waitakere City Cake Decorating Club hold their monthly club meeting on the second Saturday of every month between 9am and 1 pm, in our hall on the corner of Don Buck and Red Hills Roads. You’ll find a link to their site down the left hand side of this page. The Waitakere City Cake Decorating Club is listed under hall users. At the club’s April meeting, President Trish demonstrated how to make an interesting dish “Sushi in Icing”. Their website lists some very nice cake recipes; the featured cake is a peach blossom cake that appeals to children and the site’s editors are quite certain a few husbands, fathers, boy friends and partners do as well. Check out the photos featured on the clubs web page. Your eyes will open and your mouth water at cakes you can only dream of, unless you join the Waitakere City Cake Decorators. Mind you, if you do join you’ll likely need to turn up on Friday mornings and exercise with the Fitness League or get even more adventurous and go line dancing on Tuesday nights. Of course, there’s always Kung Fu on Thursday nights to keep the weight down while you work off the sugar rush you’ll doubtless get from scoffing all that home baking. We used to know this day as National Scrapbooking Day. Some years ago Creative Memories renamed it Memoranza. This year, together with two other consultants we put on this special day for you. Come and spend the day with friends and your photos. There will be spot prizes, raffle draws, crop talks and free give-aways. There will also be a “Make Someones Day” draw for $2 per ticket or 3 tickets for $5 – perhaps you will be the lucky one earning cash to spend on whatever product you choose! We will have a display table so please bring any pages or albums you would like to share with others. A great goodie bag, you also have the exclusive opportunity to purchase a “Best Of” paper pack valued at $37 for $18.50. This includes a sample of 2 designer sheets of 12×12 paper per power palette (including a new power palette due for release in May! ), along with gorgeous shimmer cardstock. A fantastic set at 50% discount … and only available to Memoranza customers that have pre-registered. If you are a person who loves some YOU time, this is just the BEST day out. 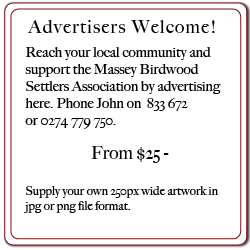 See you at the Massey Birdwood Settlers Hall, this Saturday, 19th May, from 10am till 6pm. Fitness League – So what are you doing 9.30am Friday Mornings? COME & EXERCISE WITH BRENDA NEW LOW IMPACT EXERCISE CLASS is starting in the Massey Birdwood Settlers Assoc Hall, Don Buck Rd, Massey Friday morning 9.30am on the 17 February 2012. Brenda is a teacher with the ‘Fitness League’ (formally League of Health and Beauty’), founded 1930 in England by Mary Bagot Stack, revolutionising exercise at that time. Our teachers are all trained in the Bagot Stack System and attend training to ensure their knowledge on new systems is up to date. 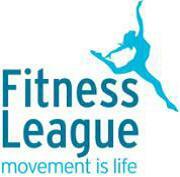 Fitness League NZ classes are inexpensive, varied, social and fun. The Bagot Stack technique teaches rhythmic movement using both contemporary and traditional music to energise, tone and strengthen the whole body. All ages and abilities are welcome. 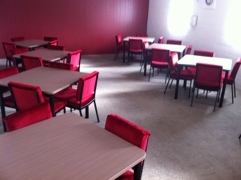 Come along and introduce yourself prior to class starting or phone Brenda on 09 478 8537. Please also check our website www.thefitnessleague.org.nz for further information. A friend introduced me to the Sunnynook Friday morning class in 2000. Working at a desk since leaving school my body needed some help, but it didn’t take long after starting with FLNZ to see improvements. I enjoyed my class so much I found a second class held at night in Murrays Bay. In 2005 and 2010 joined the teams at the Royal Albert Hall in London. On returning I joined the teacher training course and now have started the class at Massey. Where Are Your Priceless Photographs? My photos used to be in drawers, boxes or albums that caused the pictures to fade – until I found the perfect solution. Now my photos are organised in safe albums with all the precious memories captured through journaling so that I can share them with family and friends and with other people wanted to preserve their special memories too! ORGANISED – Start by getting your past and present photos in order. SAFE – Keep your photos from fading and yellowing with an assortment of photo-safe albums, photo books and other great products to ensure your memories last a lifetime and are celebrated daily! MEANINGFUL – Make sure your family stories and history are recorded and passed from generation to generation.